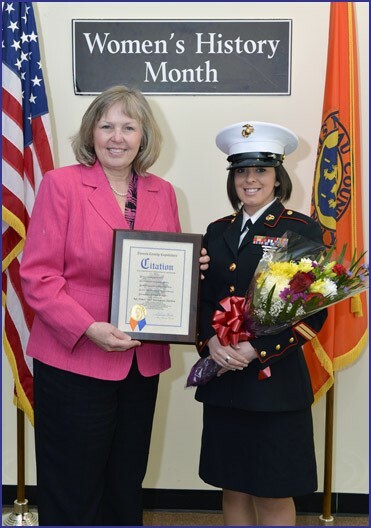 On Monday March 16th, The Nassau County Legislature took the time out to honor Women’s History Month with the 17th Annual “Women Trailblazers” Award Ceremony and Celebration. Legislator Ford chose to honor Marine Sgt. Alison Bardeguez- Perkins from her District. “I had the privilege to honor “Ali” as my Trailblazer!” said Ford. After serving five years in the active duty component of the Marine Corps and coming home in 2011, Alison not only continued to serve in the reserves, she also decided to serve with her fellow veterans at the Veterans Foreign Wars Post 1384 in Long Beach. Since then, Alison has not only been a key part in many of the VFW’s larger fundraisers and events, she has hosted three different Leukemia fundraisers, raising over $4,000 each time; and she now is preparing to host her 2nd annual Sister’s In Arms Weekend Retreat for her sister Veterans. There, they are placed in hotel rooms in Long beach, and participate in: yoga on the beach, massage therapy, zumba on the beach, acupuncture, and of course the Memorial Day Parade through town. Last year, she gathered 7 women… but by word of mouth, she now is hosting 17 women and hopes that each year it grows. ⇐PreviousMANGANO LAUNCHES AGGRESSIVE POTHOLE REPAIR PROGRAM WITH CITIES, TOWNS & VILLAGESNext⇒Create a Safety Profile for "Smart911" Today!